Visitors who want to delve a little deeper into this curious attraction are welcome to climb aboard and explore, as costumed interpreters are more than happy to put their new crew members to work raising the anchor, swabbing the decks, or even helping the captain plot a course to or from the New World. 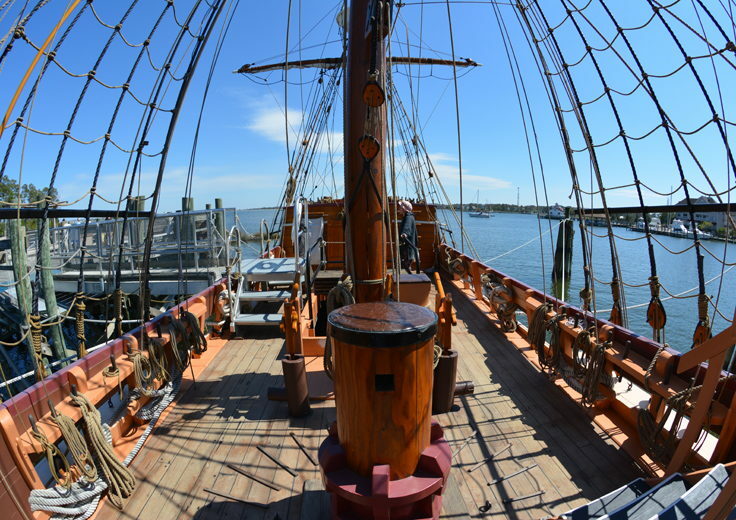 With virtually every nook and cranny of the painstakingly maintained 69' foot 0ship open for exploring, visitors are sure to have a wild adventure going back in time, and experiencing the hard life of America's earliest settlers, before they even set foot on Roanoke Island. The ship, or rather ships, that the Elizabeth II was modeled after are the sailing vessels that were sent to Roanoke Island in 1584 and 1587, respectively. At the time, Tudor-era queen Elizabeth I was trying to keep up with the New World exploration achievements of Spain, which had been sending vessels to and from the Americans for nearly 100 years. Spain had already conquered and settled the South American portions of the New World, so Elizabeth I turned her attention further north, to the modern day United States. A settlement commandeered by Sir Walter Raleigh was sent to initially set-up a colony in the southern Outer Banks, (near Ocracoke and Hatteras Islands), but after a bout with bad weather and a bit of misdirection, the colonists settled instead on Roanoke Island. This first settlement had trouble with supplies and local Native American relations, and a second colony was sent just three years later, this time with men, women and children, to try a more permanent settlement that could grow into an established New World colony. Unfortunately, the fate of these travelers went down in the history books, as this "Lost Colony" completely disappeared within several years of landing. Their fate is still argued today, and the story has become the plot of the famed "Lost Colony" outdoor drama which is performed nightly in the summertime just a couple hundred yards away from the Elizabeth II. Certainly, the daily life of dealing with the Outer Banks elements, building a settlement from scratch, and living next to a growingly hostile community of Native Americans was a hard enough life on its own. 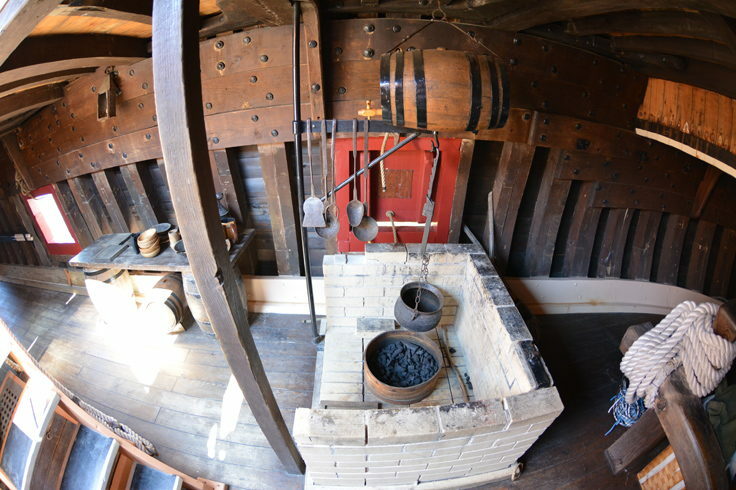 But before the colonists even got to the New World, they had to deal with months aboard a heaving 16th century ship with cramped quarters, stale food, and barely livable conditions. 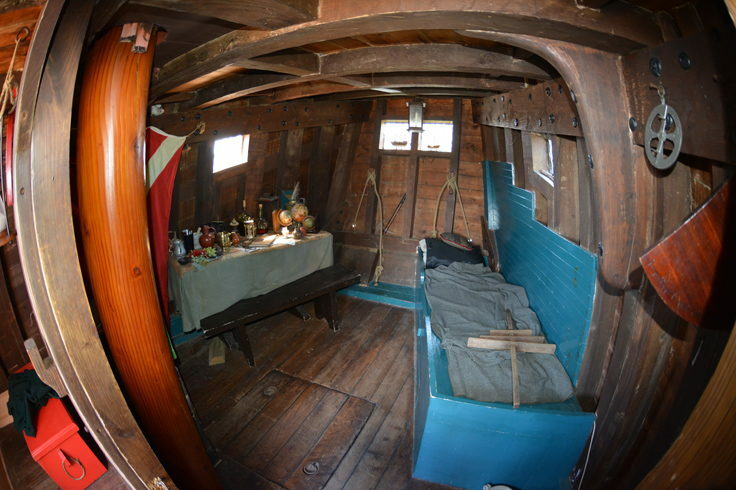 Life on the ship was really an introduction to how hard their life on the new mainland was about to be, and the Elizabeth II replica plays an important role in teaching visitors the courage and determination America's first English residents needed in order to survive in an entirely New World. 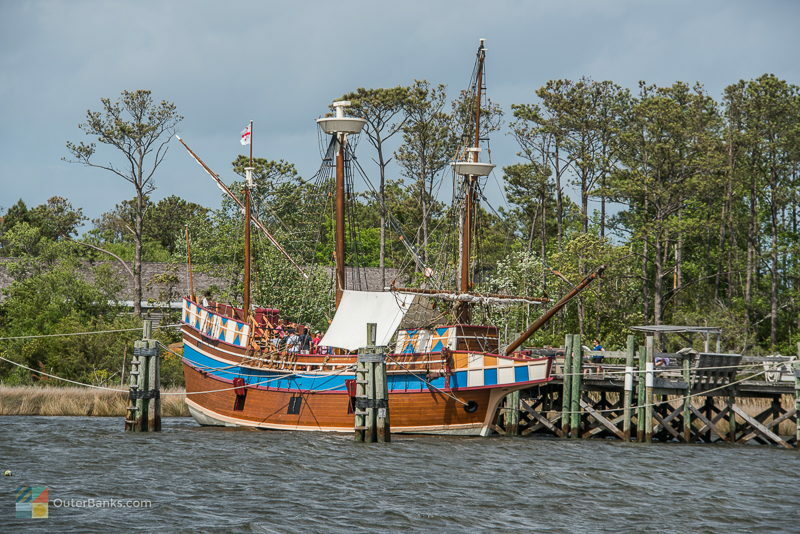 The Elizabeth II was conceived and built as an integral part of America's 400th Birthday Celebration, and was constructed from the ground up right in Manteo at "The Boathouse," which now serves as the Roanoke Island Maritime Museum in downtown Manteo. Popular since it first laid out the gangplank, the Elizabeth II is still an admired and eye-opening attraction for visitors, and an incredible head-turning sight along the Manteo harbor. With no detail spared from the colors of the Tudor flags to the navigational instruments in the Captain's Quarters, the Elizabeth II is truly a remarkable way for visitors to experience the hardships of the first colonists, while still being able to step off of the ship, and step back into modern times. The Elizabeth II can be found in the middle of Shallowbag Bay at the very edge of Roanoke Island Festival Park. 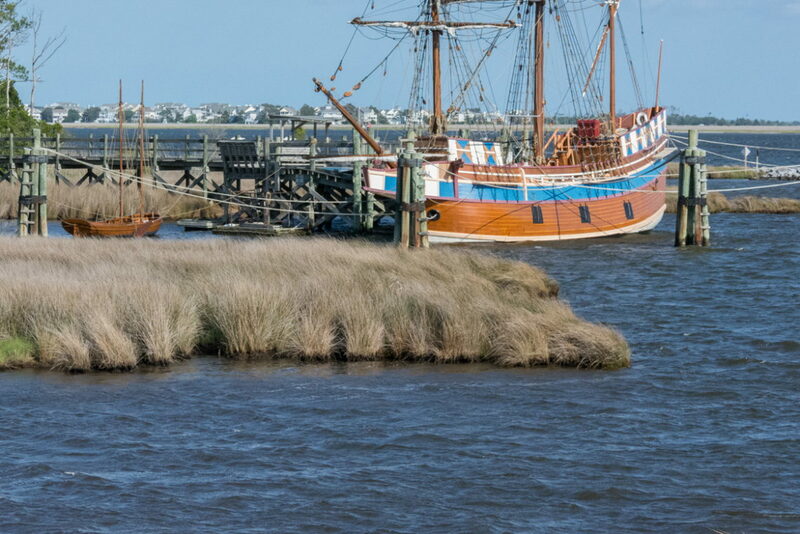 Visitors can access the site by entering the Roanoke Island Festival Park, and crossing over through downtown Manteo via a well-placed boardwalk that spans across the bay and presents some pretty incredible views of downtown and the Elizabeth II herself. At the site, visitors are free to walk around the docks and grassy areas where the Elizabeth II is stationed, but a small admission fee is required to board the ship and take the full and well-guided tour. The ship is well-stocked with trained and costumed crew members who are happy to answer questions and explain the daily operations of life on the ship while out to sea. The crew members rotate, and visitors will ever quite know what to expect on any given Elizabeth II adventure. 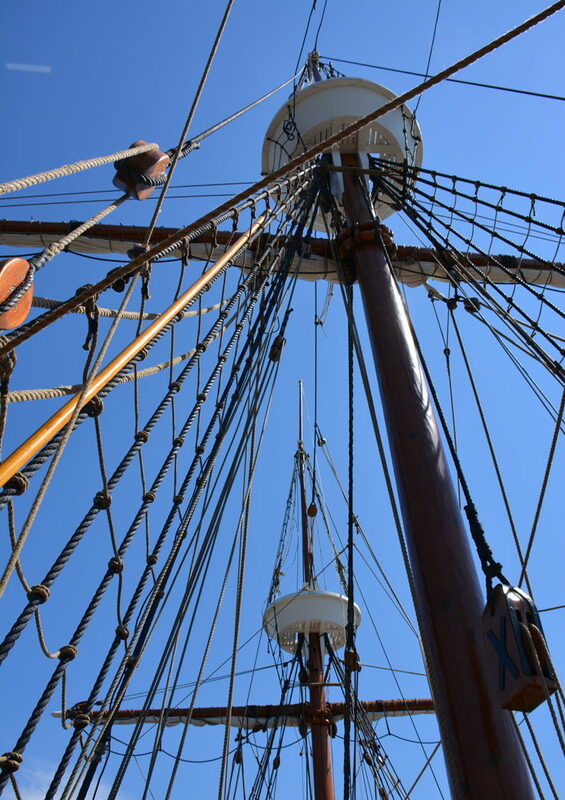 On the topside, or the main above-ground level, visitors may be asked to help set the sails or swab the decks as they wander across the ship admiring the hundreds of yards of intricate rigging, and the incredible views of the downtown located just across the bay. Visitors may even be asked to help raise the heavy anchor out of the water, or lower it back down to keep the ship safely near the docks. The "top level" is a pleasure to explore, and on a clear summer day, the breezes and the open water views may make even the most die-hard landlubber want to take to the sea. 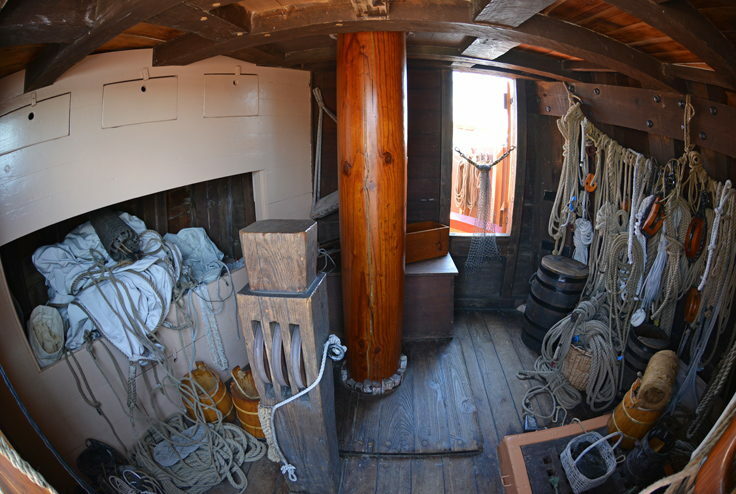 The lower level , however, is not for the claustrophobic, and visitors can wind through narrow hallways to different compartments that were well-known to the captain, crew, and the everyday pedestrian settlers. In these areas, visitors can shift through barrels and boxes to see what goods are being carried to the New World, try out the straw and feather mattresses that served as beds for months at a time, or even pass the time playing checkers with a local 16th century sailor. No detail has been overlooked, and many visitors marvel at the thought of living in such cramped quarters for months at a time, with nothing but the open ocean to look at for entertainment. The staff and crew of the Elizabeth II take great efforts to make sure everyone gets a hands-on visit, especially their youngest visitors. This is definitely a kid-friendly excursion, as kids are usually the first visitors to get recruited to help the captain find his latitude with an astrolabe, or turn the giant sailing mechanisms that lower or raise the sails. Extremely educational while still feeling like a fun day playing pretend at sea, vacationers are encouraged to bring along their youngest family members who will certainly have an incredible interactive and eye-opening experience. The Elizabeth II is open daily, generally from 9:00 a.m. until 5:00 p.m., and is open year-round except for the rare occasions when she takes to sea to visit other locations. In the spring and fall months, the Elizabeth II has been known to leave the harbor to serve as a traveling exhibit to other East Coast destinations, often cruising in tandem with the Silver Chalice, a smaller 24' replica of the boats that were used after arriving on Roanoke Island to transport goods and colonists to the shore. Maritime history lovers who can't squeeze in a visit to the Elizabeth II or the Outer Banks are advised to look out for these seasonal tours for an opportunity to see history in action, literally, and heading to a port near their home town. 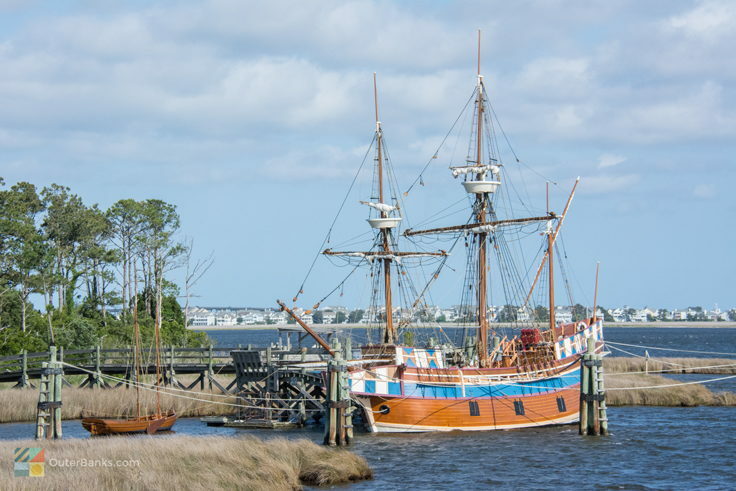 Other than these small seasonal excursions, the Elizabeth II is wide open to visitors, and everyone is encouraged to take a tour, either as a part of a full Roanoke Island Festival Park excursion, or as just a scenic side trip during a Manteo waterfront stroll. Don't have time to take the full tour? Visitors are free to explore the exterior of the ship at their leisure, snapping as many photos as they'd like. Virtually every angle can be admired from the grounds surrounding the ship at the docks, and from across the water along the waterfront paths of downtown Manteo. 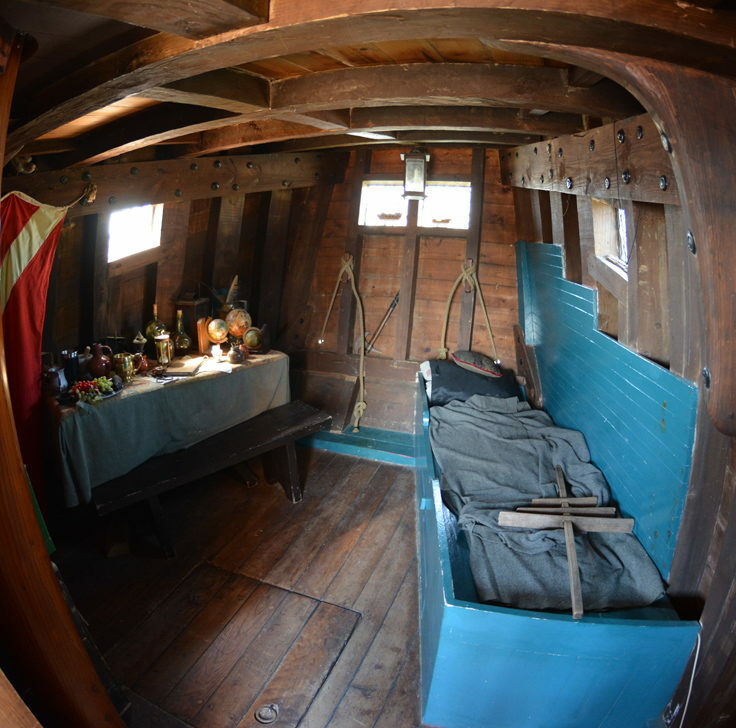 Pay close attention to the intricate detail that was put into the construction of the ship itself from the small, wobbly-looking crows nests to the brightly colored decor touches along the exterior, and even along the bottom of the boat itself. 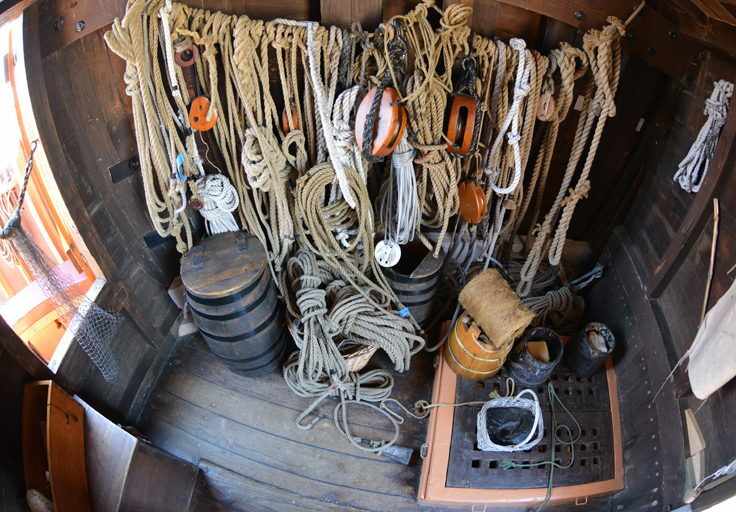 While a couple minutes of admiration will certainly suffice, visitors are advised to take their time and peruse the ship from top to bottom, and enjoy all the painstaking recreation details. For a real treat, enjoy a quick lunch or leisurely dinner at one of downtown Manteo's many restaurants bordering the boardwalk entrance of Roanoke Island Festival Park. Most all of these establishments have outdoor seating overlooking the water, and patrons can enjoy a good meal or a cold cocktail overlooking the Elizabeth II docked nearby. For a little history that requires no effort whatsoever, and one of the best waterfront dining views on the Outer Banks, these local establishments are a must stop for any Manteo visitor. If you're taking the full tour of the Elizabeth II, don't be afraid to ask questions. The staff and crew are more than happy to engage with visitors, and will answer any queries that a visitor might have, from the duration of the trip to the number of lines attached to each sail. Get your curiosities out in the open, and let the crew members guide you to further your experience of touring the Elizabeth II. The Elizabeth II may certainly be a highlight of the Roanoke Island festival park, but it is by no means the park's only attraction. Visitors are advised to dedicate a full morning or afternoon exploring the park in its entirety for a full, interactive experience of the Roanoke Island colonists' lifestyle. Browse through the working Native American and English settlement villages for an in-depth tour of the daily island life more than 400 years ago, and chat with costumed residents who are happy to explain the difficulties colonists faced after coming ashore. The park also has an extensive history center and museum, as well as a gift shop for one-of-a-kind treasures to take home. 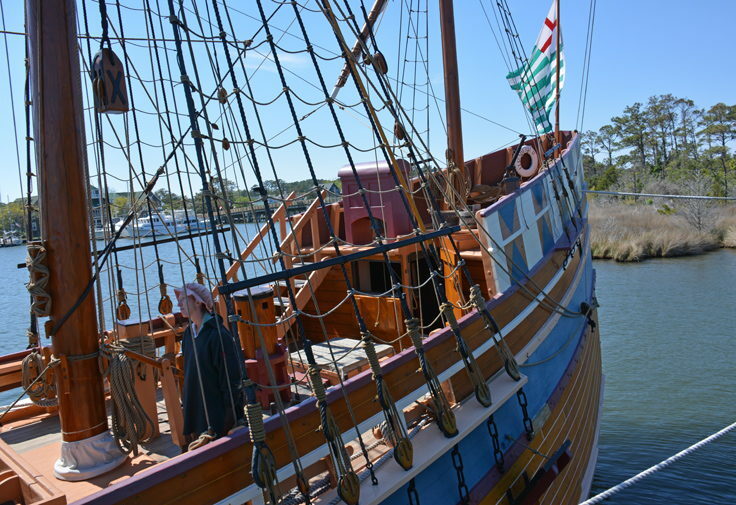 The Elizabeth II is certainly an attraction all its own, but the surrounding attractions of the Roanoke Island Festival Park paints a complete portrait of the English settlers' full experience. The Elizabeth II has been turning heads since it was first constructed and moved just a few hundred yards from the Manteo Boathouse to its permanent location in Shallowbag Bay. 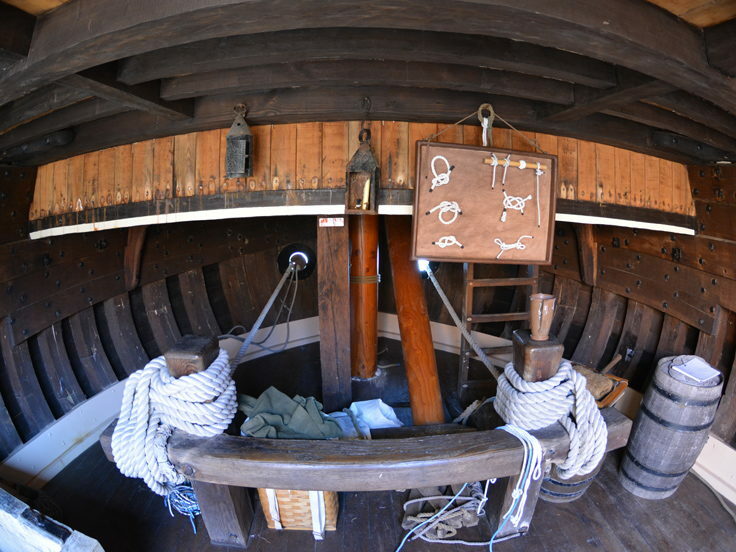 An incredible attraction that has been drawing visitors for nearly four decades, the ship is a masterpiece of boat building, and a replica so true to life that visitors may forget that they're in the 21st century. 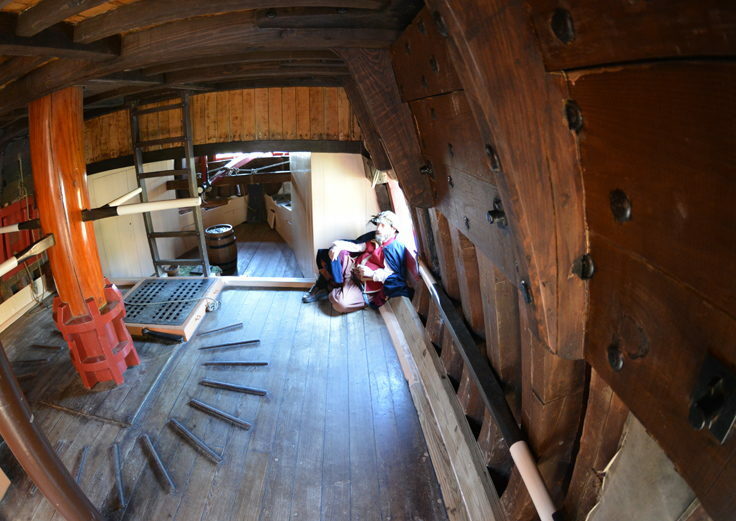 Take an in-depth tour of the ship to meet and greet with a 16th century crew hard at work getting the settlers on their way to building a New World in America, or simply admire the site from a comfortable chair at your favorite local waterfront restaurant or pub. The Elizabeth II simply enhances the Manteo scenery, and cements its reputation as one of the most fascinating and history-rich vacation spots on the Outer Banks, and the entire East Coast. For a close look at where America History all began, be sure that your crew sets sail for a visit to the Elizabeth II.